The Poker Room at Thunder Valley Casino Resort | Lincoln, CA: What's the Catapult Field Playing For? What's the Catapult Field Playing For? 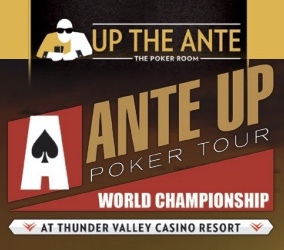 Cards are in the air for the final 126 players in the kickoff event of the Ante Up Worlds. There's $34,200 in cash to today's winner of the $160 Catapult, and also a jumpstart to the 2017 Ante Up Worlds Player of the Series. The top three finishers in the Player of the Series race after the first 14 events win prizes that include a World Championship entry, one-night hotel stays and credits to High Steaks Steakhouse and Red Lantern.